Waterproof dog beds are almost a necessity in the UK during winter. There aren’t many dogs that come in from a winter walk without mucky feet and will more often than not jump straight into their bed. Most importantly The shift in modern technology has enabled materials with excellent cleaning and durability properties to be available to everyone. Most important things to look for when buying a new dog bed? Dogs can certainly be very destructive. As a result, you will need a bed that wont be torn apart. Most importantly beds can come with a large price tag therefore you need to ensure that it will last. Today’s Modern materials means todays waterproof dog beds are the best we have ever had. We have picked some of the best waterproof dog beds below. As dogs get older their legs certainly wont function as well as they used to. As a result they may struggle getting in and out of a low bed. The bed needs to fit you dog not too big or not too small. Beds or normally measured length and width. Next time your dog is curled up, to get an idea of the size bed they need, give them a measure. The petfusion ultimate is strong, robust, and most importantly waterproof meaning its easy to clean. The petfusion ultimate sits at the higher end of the market, so does appear a little expensive. It wont look out of place in you home either and comes in 3 color choices. PetFusion have done really well producing an orthopaedic bed that has excellent durability and longevity. The Snoozezy dog bed design is primarily for dogs with arthritis and hip dysplasia. However, any dog will love to jump up onto the Snoozezy for a nap. The manufacturer carries out Over 10000 on the snoozezy bed, each with loads of over 80kgs continuously bouncing on the bed. This was to simulate a heavy dog jumping on and off over 10,000 times. The sturdy steel frame is coated to prevent rust which means it can be easily wiped clean or hosed down required. It lifts your pet off the floor and allows air to circulate which helps them stay at a comfortable temperature. Its more hygienic – The mat is breathable which prevents mould and mildew. Provides firm, uniform support for all pets, not just those with arthritis and other joint problems. Lightweight and portable and can be easily moved inside, outside or even taken on a camping trip. They with a easy to carry bag too for easy storage or transport. The dog wont be able to destroy The snoozezy bed as it contains no stuffing. The cover can be removed and washed if its gets very dirty. Steel Frame suitable for indoor or outdoor use. 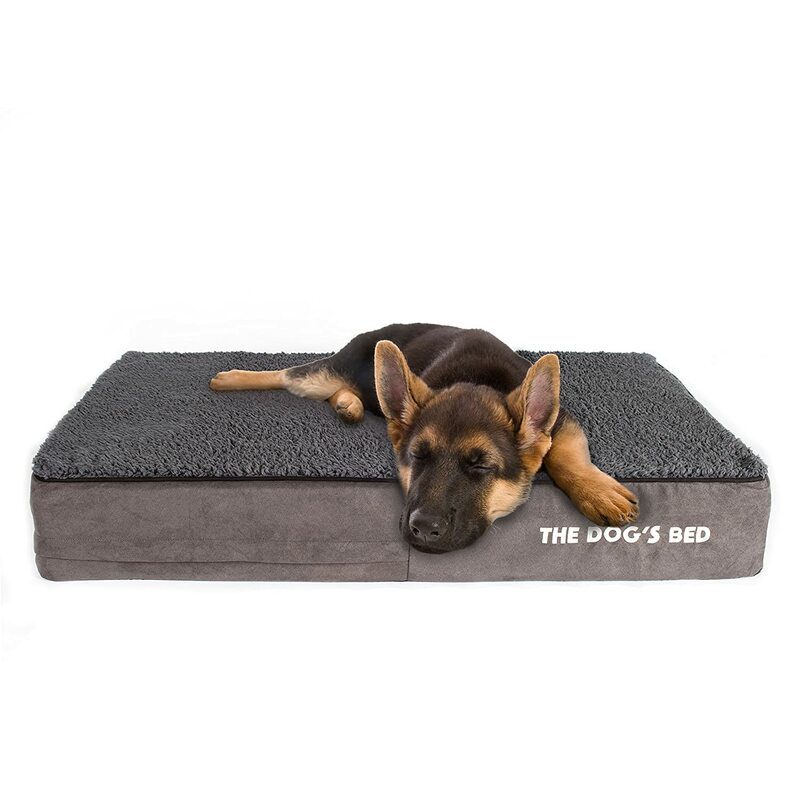 The Dogs bed – Orthopaedic Memory Foam Waterproof Dog Bed is similar to the top rated Petfusion. It does lack the side bolsters that the petfusion bed has, however, it has a 10cm deep mattress or 15cm on the XL sizes. Made from waterproof hypoallergenic Oxford fabric which is soft but tough. The removable cover like many other beds is wipe-able or machine washable. The fabric is resistant to moulds, mildews and dust mites and replacement covers are available. Excellent medical grade orthopaedic support for older dogs providing therapeutic comfort for arthritis pain, muscle stiffness, hip dysplasia, arthritis and aching joints. Machine washable outer cover. With additional inner waterproof cover. The P & L bed is one of the best beds for all wet and muddy dogs. The heavy duty hard wearing 100% polyester waterproof cover is easy to clean. The cover is wipe-able or hose-able. The bed has high sides to keep out any draughts and will insulate your pet from any cold floors. The base cushion is removable and washable when its dirty. Easy to keep clean and odour free. Durable and comfortable and made in the UK.